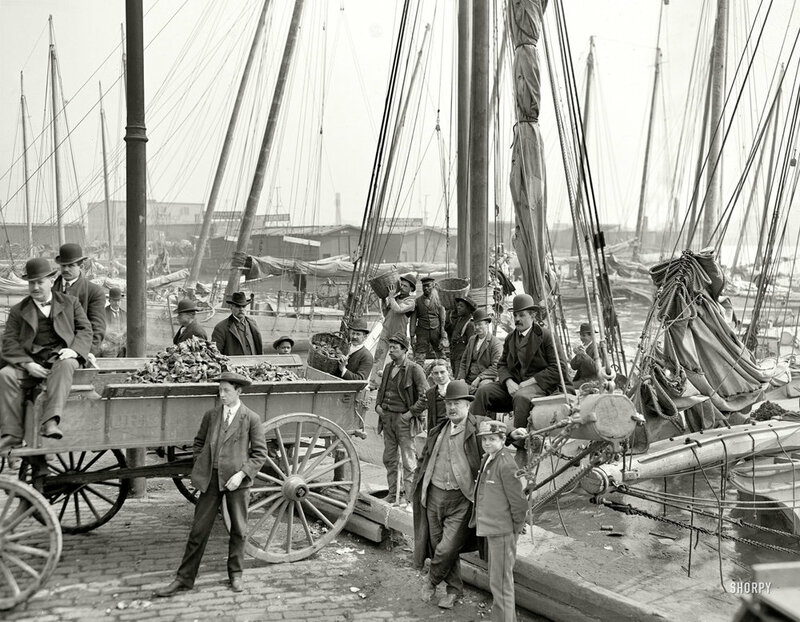 In this 1905 photograph, a burst of dockside activity at Baltimore’s working waterfront harbor has been captured for posterity. Oysters by the bushel-full are unloaded from bugeye to wagon. Unlikely characters for such muddy labor are dressed in bowler hats, ties, and jackets, while dockhands, better attired for the job, hoist their cargo in creased, stained work clothes. The harbor’s surface is fouled with a scum of refuse and slime, a reminder of the fact that Baltimore’s sewer system was built 7 years after this photo was taken. In the foreground, a bowsprit thrusts almost into the camera, while another, with sail furled, crosses below. A photo is worth a thousand words, but a picture like this, rich with detail down to the oyster shells crushed into the cobblestones, can be better than time travel.